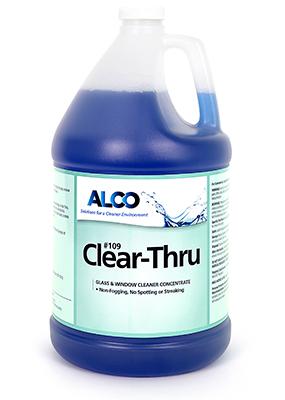 Alco Clear Thru - Alco-Chem, Inc. Concentrated alcohol based glass and window cleaner. Removes heavy soil accumulations from glass, windows and mirrors with streak free results. Non-freezing formula. 4:1 dilution ratio..